The Los Angeles Lakers didn’t receive promising news on Monday afternoon. The team learned that rookie Lonzo Ball wouldn’t be able to participate in the NBA Summer League championship game against the Portland Trail Blazers due to a calf strain. 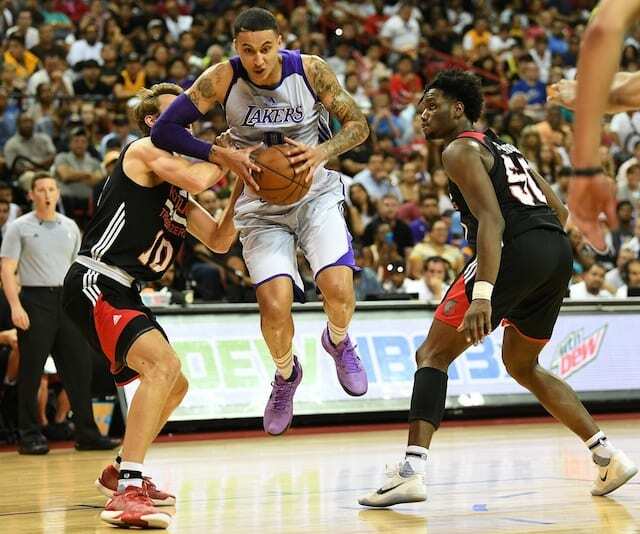 Fortunately, even without the Summer League MVP on the floor, the Lakers were able to prevail against a talented Blazers squad at the Thomas & Mack Center. Fellow rookie Kyle Kuzma was the main reason for the team’s success on Monday with the Utah product exploding for 30 points and 10 rebounds. With Summer League wrapping up for Los Angeles, the next time the team will take the floor with these young players and the returning veterans will be Sept. 30 in their first preseason game. Los Angeles will go head-to-head against the Minnesota Timberwolves at the Honda Center.